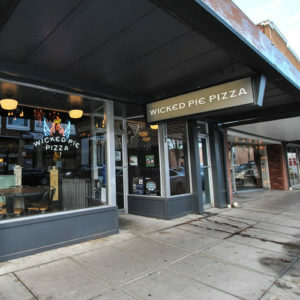 As lifelong pizza makers, we decided to open a new concept, Wicked Pie Pizza, in the booming downtown neighborhood of Puyallup, Washington. Months before we opened, curious onlookers peeked their heads into the former music shop, and outlandish rumors spread quickly. One person saw a team of masons reportedly brought in order to restore the original 1900s brick. Another person heard they had original tin ceilings, which needed restoration and repair. A reporter wrote a crazy story about a chef from Italy, who had been rewarded with his lifelong dream, of immigration to the United States. The rumor said an American restaurateur from Seattle, Vic Rosellini, dined in the restaurant where this fabled chef performed. Rosellini was so impressed with his meal that he requested to meet the chef immediately, and insisted he must move to the US and work in his famous Seattle restaurant, Rosellini’s 410! The chef couldn’t believe the special opportunity extended to him and sprinted home to tell his parents! Overwhelmed with joy, he told his parents everything Mr. Rosellini offered and together as a family, they wept with tears of joy and excitement to see what the future would hold. As it turns out the tall tales are true! The ceiling above you is original tin. The historic building you sit today is 1900 brick. The great pizza you put into your mouth… well, let’s just say it originated from the chef we told you about earlier. You see the chef was my Grandfather, Italo Carsiello. He emigrated from Italy, worked 10 years for Rosellini and saved every penny he had to open his own restaurant. We were raised in his restaurants, developed a passion, and here we are now. 50 years of family recipes, hard work, ingenuity, and the highest quality of service have led us to share our traditions at Wicked Pie Pizza. The quality of our pizza means everything to us, and we strive to serve only the best! Our sauce is slow-cooked in the most traditional way. The recipe is exactly the same as Grandpa Italo taught us three generations ago: savory, zesty, and delicious. Our cheese is fresh whole milk mozzarella brought in from Wisconsin. Our dough is made daily with our Artisan Power Flour and tossed by hand. Our drinks include a unique selection of craft beers, wine, spirits, our World-Famous Bloody Mary and a variety of mixed drinks made with freshly squeezed juices.